Colorado Has a State Fair? Well, clearly, I knew that it did … I’ve just never been. Thanks to the husband, I’ve been to Minnesota’s state fair plenty of times, but Colorado’s? Nope. It’s down in Pueblo, it’s hot down there, it’s a crap drive, no one really likes Pueblo (not even some people I’ve known from there) … why would I want to go? Still, going is something I felt like I should do. We finally decided, you know what, screw it, we’re going this year. 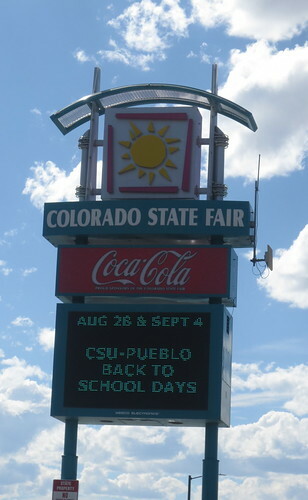 We did a long ride in the morning of September 6 and then drove down to see what the Colorado State Fair is all about. 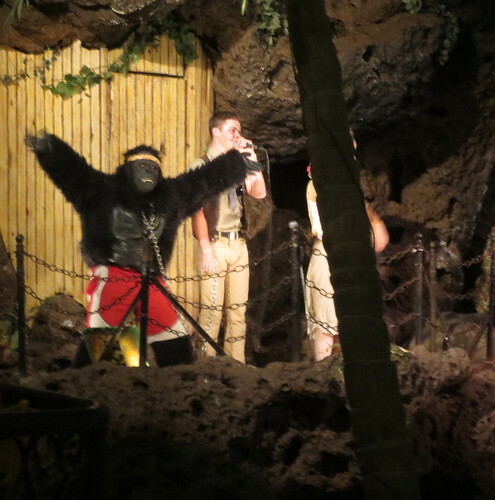 We waited in the admission line which was horrible – line was wrapping around the corner and they had, at any one time, two (of six or eight) windows open. For a brief second, a third window was open, but that got closed quickly. If you go, buy tickets ahead of time if possible. We walked in and our first thought was FOOD. (We were possibly a bit hangry from our ride still.) Too hungry to walk the entire fair to see what was up for food options, we saw some barbecue truck and split a pulled pork sandwich. I’m so glad we split it because it was … not good. Still, food is food, and it helped calm us down to the point of thinking straight again. We were right near some cows and a milking demonstration (they were letting kids milk cows), so we decided to walk over and check it out. 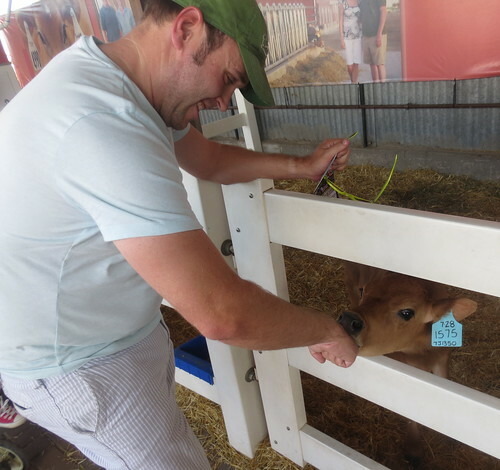 Brandon got nommed on by a calf; it was kind of cute. Like in Minnesota, there was an ice cream/milkshake stand attached to the dairy bar. One of the dairy bars in Minnesota’s is a must-stop for Brandon (chocolate milkshake), so he decided to get one in Colorado to see how it compared. It was good, but not quite as good, according to him. Me, I got a root beer float. Needed more ice cream. 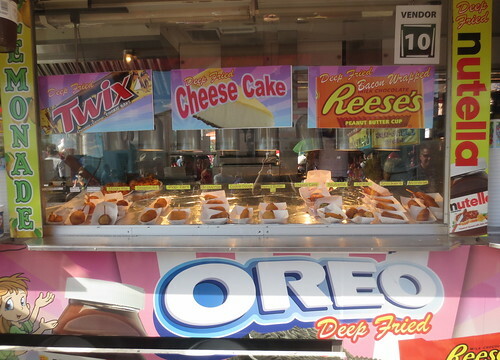 With even more calories in our bellies, we started walking the fair. It didn’t take nearly as long as it does in Minnesota because the Colorado State Fairgrounds take up … maybe a third of the space as in Minnesota? I was disappointed that the shops and stalls were very generic with stuff I felt like I could get anywhere. There was a lack of local crafts and artisans which was disappointing. 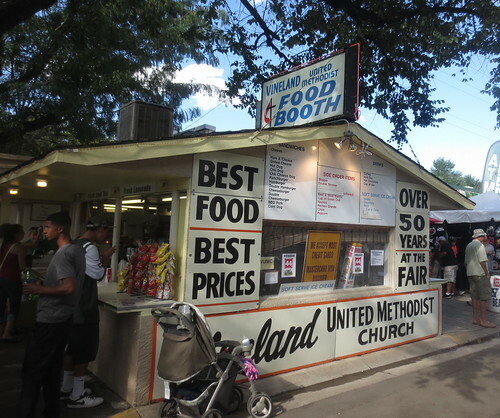 Both state fairs I’ve been to have some variation on this – some church food booth that’s been around forever. and I stopped there for the bacon-wrapped chicken and the chocolate-covered bacon. The bacon-wrapped chicken was super dry and the chocolate-covered bacon paled in comparison to Famous Dave’s pig-lickers (that you can get at Coors Field, even). We didn’t even finish it. So. Many. Colorado. Plates. I happen to like our license plate, so this display was really neat to see. 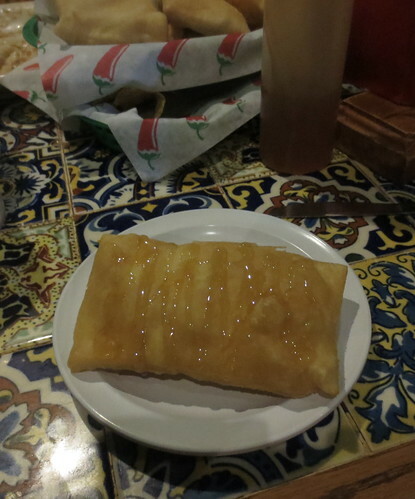 I did notice one food item in Colorado I hadn’t seen elsewhere – deep-fried Nutella. I was tempted to get it, but I didn’t. 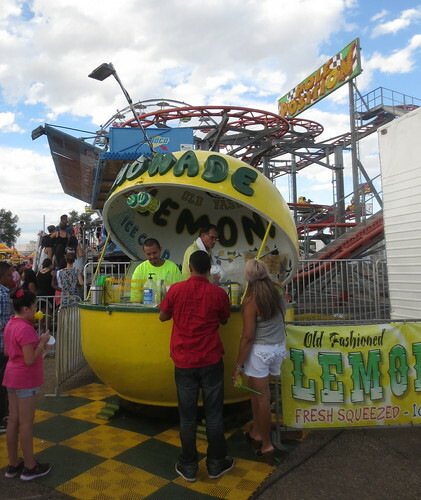 I also found this lemon lemonade stand cooler than the root beer barrels at the Minnesota State Fair. 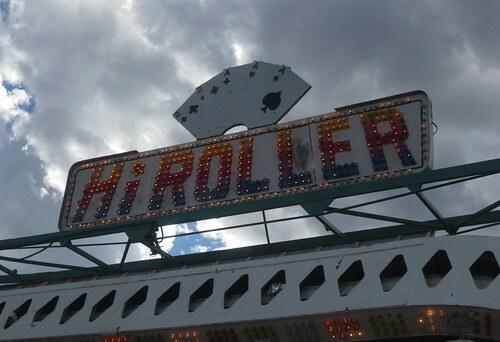 I do feel like the midway in Colorado was bigger than Minnesota’s Mighty Midway … if not slightly more ramshackle. Was it worth going to? Yes, because now I’ve gone and I don’t have to ever go again. Would I advise it? Well … anything’s usually worth doing once, and I’ll agree with that statement in this case. If you’re a Coloradoan like me, it’s NEVER a bad thing to help support your home state’s economy. 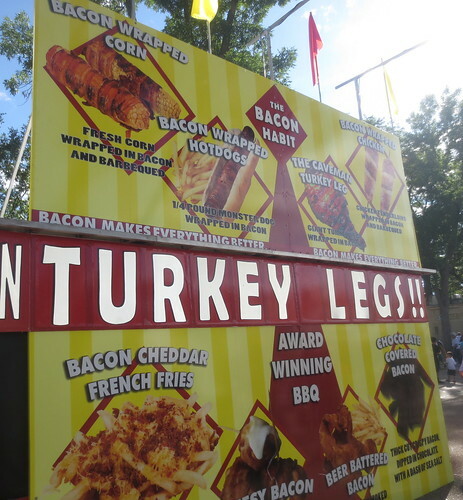 If you haven’t been to a different state fair, it also might be worthwhile. But if you’ve been to Minnesota’s, or Iowa’s, or Texas’s … just know that it’s not going to be as good. Over the past … year, probably, I’ve developed somewhat of an unhealthy obsession with lobster rolls. 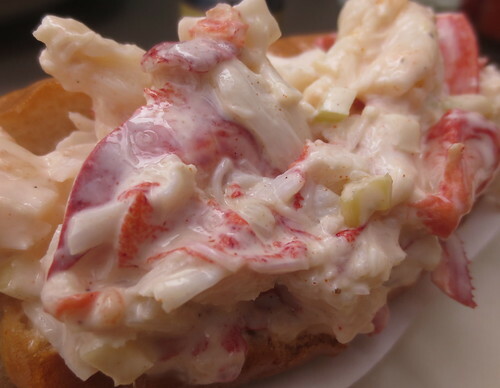 I’ve eaten several of them at Lobster Me in Las Vegas (warm lobster rolls are the BEST) but have been trying to find good ones in the Denver area. Fresh Fish Company? Is okay. Everything I’ve read, however, says go to Steuben’s. 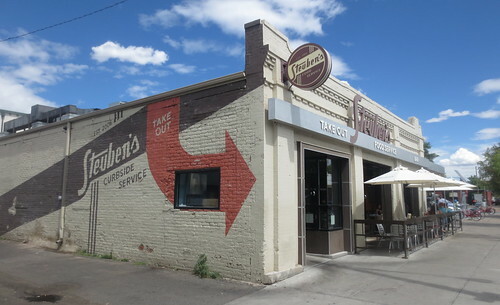 Steuben’s, located on 17th Street in the Uptown neighborhood in Denver in a former garage, is almost like a retro diner on crack, recreating, as the website says, “American Regional classics.” The decor is all in chocolate browns and sky blues and is richly gorgeous. The owners named the restaurant after a restaurant/nightlife hot spot their great uncles owned on Boylston St. in Boston back in the 1940s through 1960s. After learning of the Northeast heritage/roots, I wasn’t surprised they had the best lobster roll in town. I went one Thursday afternoon about a month ago. I had tried hitting up Civic Center Eats for the lobster roll food truck, but the truck wasn’t there, so I said screw it, and drove over to Steuben’s. I loved the aforementioned decor. 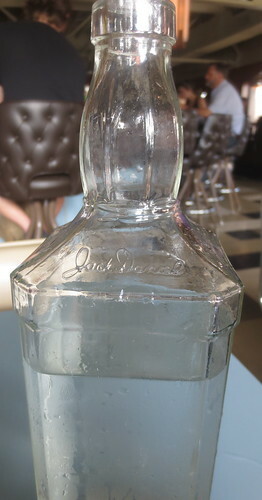 I enjoyed how the water jugs came in re-purposed liquor bottles. 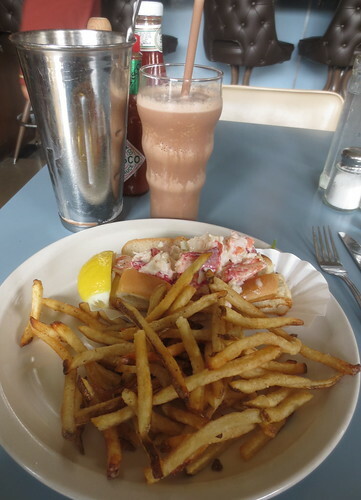 I ordered the lobster roll (of course) and treated myself to a chocolate shake. It came, as all good shakes should, with a tin of the extra on the side. It. Was. Delicious. I know I said above that I prefer warm lobster rolls (lobster and butter in bread as opposed to essentially lobster salad), but Steuben’s roll was on point. The fries were wonderful (if not a tad under-salted) and the shake was rich, thick, and everything a chocolate shake should be. 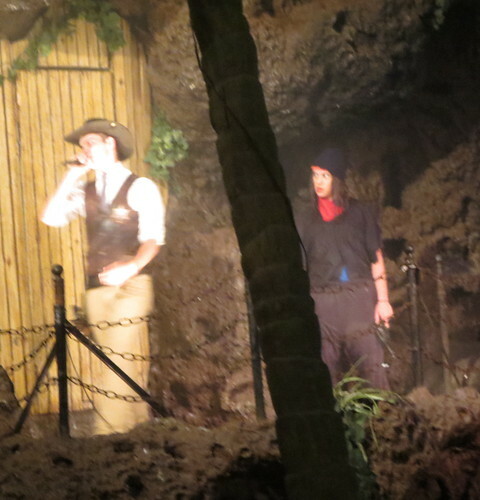 I raved about it to Brandon later and as a result, we found ourselves there a few weeks later. We happened upon happy hour and I noticed they had deviled eggs for $.50 each. 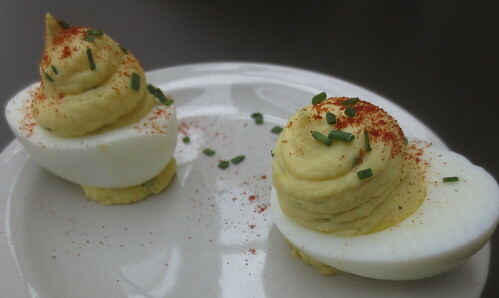 Clearly I had to try some, because seriously, who has deviled eggs on their menu? I will say that I prefer my mom’s or my brother’s over Steuben’s, but they were totally worth the dollar. 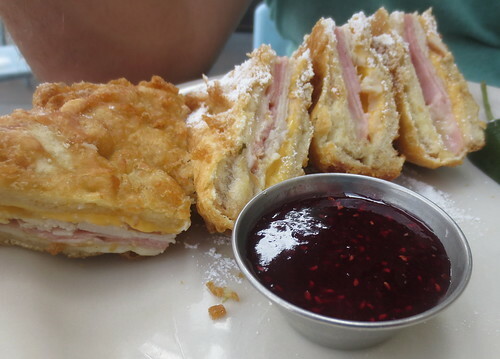 Brandon tried the Monte Cristo, and it was as rich and artery-clogging as you’d expect of a good Monte Cristo. I probably should have tried something different, but that would just be insanity. I should probably go back and try more of the menu – everything I saw being delivered to the other diners around me/us looked fantastic – but I can’t guarantee I won’t just order the lobster roll again, because I am weak. Still, tasty place, highly recommended. 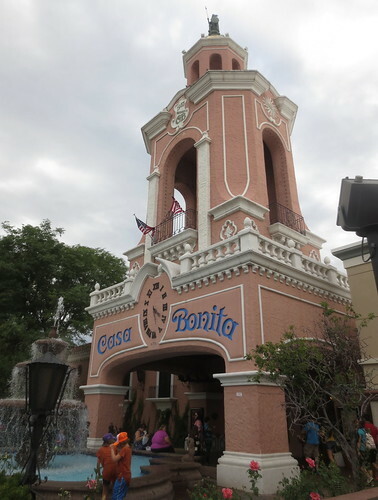 If you grew up in Denver – or watched “South Park” in the early 2000s, you’ve probably heard of Casa Bonita. If you haven’t, you should probably try and find that episode (it’s from 2003) and watch the last seven minutes or so. Everything Trey Parker and Matt Stone put in there? Completely accurate, down to the sketchy strip mall the restaurant lives in. 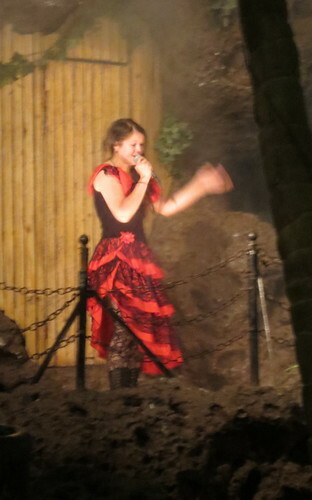 In any case, Casa Bonita is affectionately known as Mexican Disneyland. We used to go when I was a kid relatively frequently (frequently being whenever we had out of town guests) and I remember hating it. 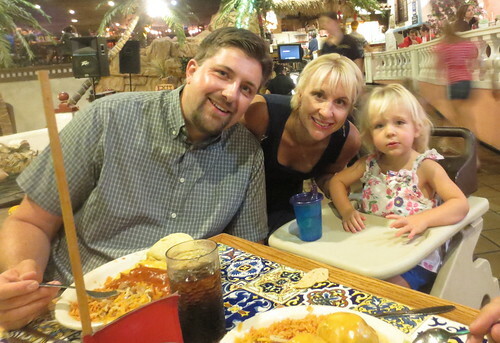 Of course, I’ve never been the biggest fan of Mexican food and Casa Bonita’s is not … good. 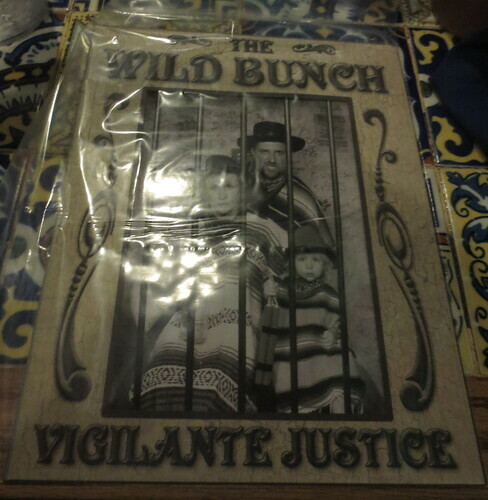 However, when Brandon and I got married, we decided (okay, I did, because I’m cruel) to take a lot of our out-of-town guests and friends – most of whom didn’t know each other – and take them to Casa Bonita without their knowledge. This pink tower is in a ghetto strip mall on west Colfax. Birthday family (and a glimpse of the food). Black Bart (or, in this case, Bertha) show. 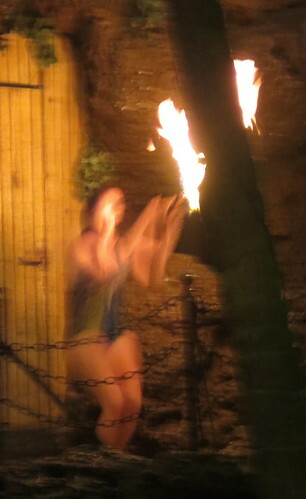 Flaming juggler cliff diver show. 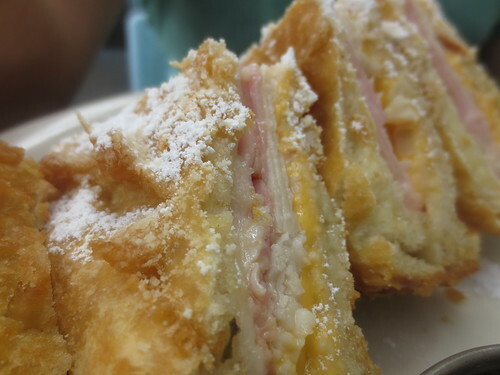 Sopapilla. Really the only reason to come – they are as good as advertised. 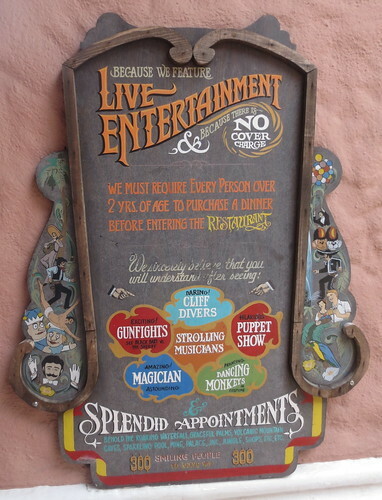 Not pictured: Black Bart’s cave, puppet show, mariachis (didn’t see them that night …), falling apart arcade. If you find yourself in Denver and want a truly “Denver” experience (that’s not the damn mountains) … go. It’s totally worth it.